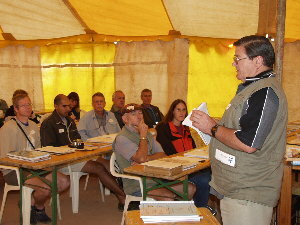 In April 2003 the Vulture Study Group (VSG) held its annual meeting on Aandster farm, Namibia. Peter and Marilyn Bridgeford did a wonderful job of hosting the meeting. 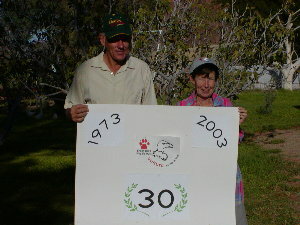 The VSG celebrated its 30th year of existence, with the meeting being organised by Kerri Wolter, manager of the VSG. Photo H.D. 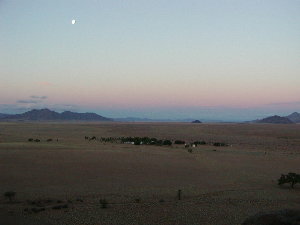 Oschadleus Sunset over Aandster. 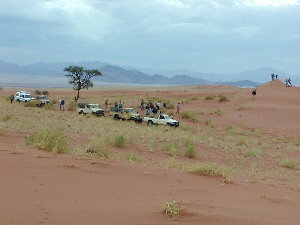 Aandster is one of the farms making up the 180 000 ha private game reserve NamibRand (adjoins the Namib Nauklauft Park). 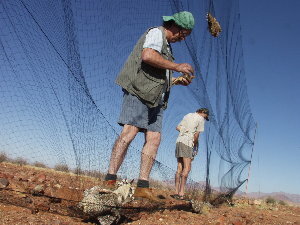 Peter Bridgeford is one of two game wardens (the other is Peters boss, Achim Lensen) employed on NamibRand. Photo Dirk Heinrich It was a privilege having Dr John Ledger as chairman of the meeting, as John was one of the founding members of the VSG. Seated left to right are myself, Ara Monadjem (Swaziland), Angus Anthony. Seated in the front row are Steven Piper and Christine Koenig (University of Natal). Photo Dirk Heinrich As always the food was excellent! 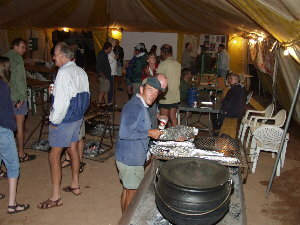 Marc Durr (centre foreground) helped with the potjie. Photo H.D. 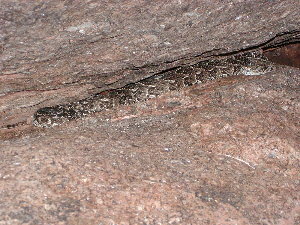 Oschadleus Puffadder found in a cleft on the koppie near the farmhouse. Photo H.D. Oschadleus On the second morning of the meeting a group of birders got up early to look for Dune Lark. Marc Durr of Toktokkie Trails showed us one. Dirk put out a flaptrap with a mealworm. The lark had a close look but was not interested! At least we had stunning views of the lark running about at our feet. 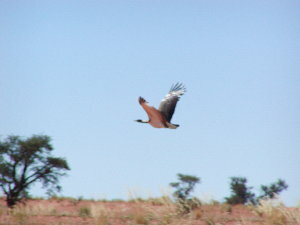 After 2 days of meetings Peter took us around the farm to see some wildlife and scenery. Photo H.D. 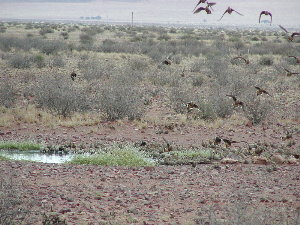 Oschadleus Namaqua Sandgrouse drinking at a waterhole. Photo H.D. Oschadleus There are many Sociable Weaver nests on the farm. 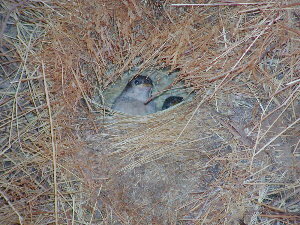 Here chicks are begging for food at the nest entrance. Photo H.D. 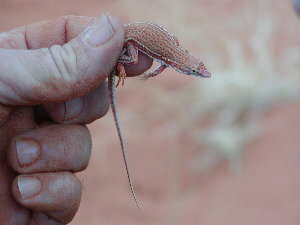 Oschadleus Dirk found a Wedge-snouted Lizard. It wriggles and quickly disappears below the sandy surface of the dunes. Photo H.D. 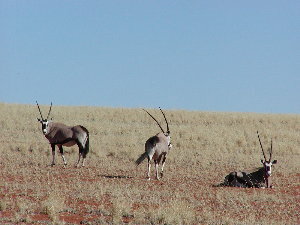 Oschadleus Oryx (Gemsbok) are common on the farm. Photo H.D. Oschadleus Ludwig's Bustard. Photo H.D. Oschadleus Old nest of Lappetfaced Vulture. Peter has been ringing the chicks in a long term monitoring study and is the top ringer for this species. Photo H.D. 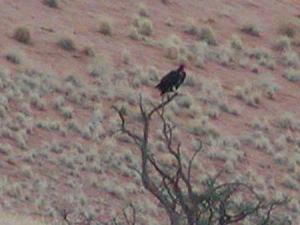 Oschadleus Lappetfaced Vulture. Photo H.D. 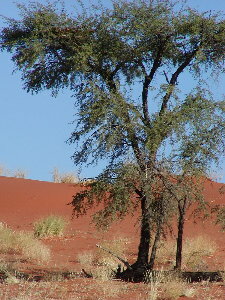 Oschadleus Vulture restaurant consisting of Oryx carcass at a waterhole, and a viewing hide that is mostly underground. Photo H.D. 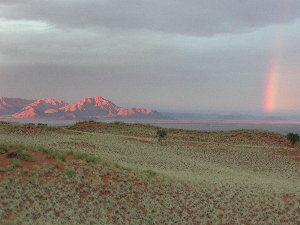 Oschadleus The setting sun casting its last rays on the mountain, and a rainbow. 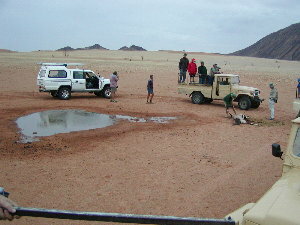 During the week there were rain showers through much of Namibia - totally unexpected. Dirk Heinrich, photographer and active bird ringer, organised informal ringing sessions on the farm after the VSG meeting. 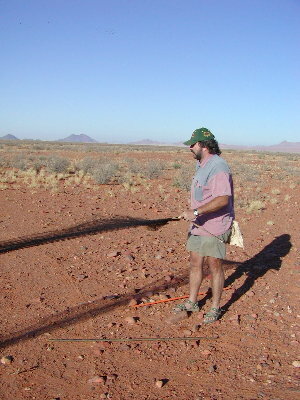 Here he is putting up mistnets at the waterhole, to catch sandgrouse. Photo Dirk Heinrich Other Namibian ringers that were present were Mark Boorman (left) and Sandra Dantu of Swakopmund, Holger Kolberg (right) who issues bird ringing permits in Namibia, Liz Komen, Rob Simmons, and Peter Bridgeford. It was great to meet some of these ringers for the first time. Photo H.D. 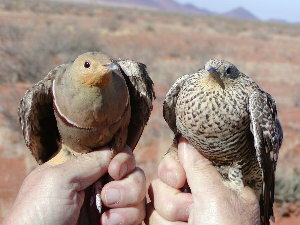 Oschadleus Male and female Namaqua Sandgrouse. 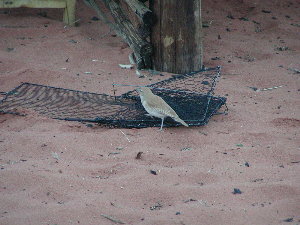 We caught 76 sandgrouse in total. Photo H.D. 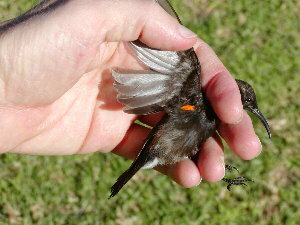 Oschadleus Male Dusky Sunbird caught at the farmhouse - note the red pectoral tuft. Photo H.D. 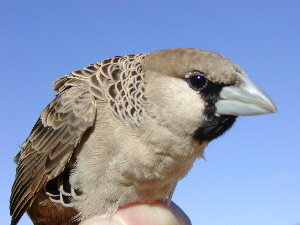 Oschadleus Sociable Weaver. Photo H.D. 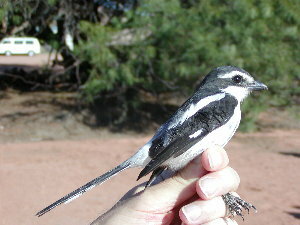 Oschadleus Fiscal Shrike - western birds have the distinct white eyebrow. Photo H.D. 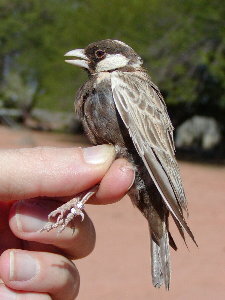 Oschadleus Male Greybacked Finchlark - the only one caught, although we had seen large flocks on our drive around the farm. Photo H.D. 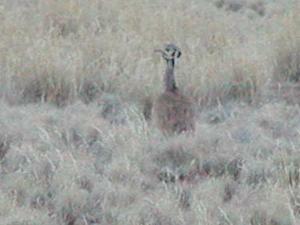 Oschadleus Ruppell's Korhaan, a Namibian endemic - a first for me! Photo H.D. 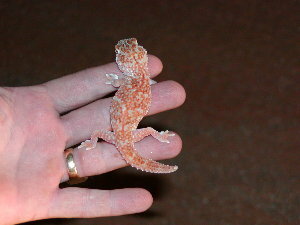 Oschadleus Giant Ground Gecko. Photo H.D. 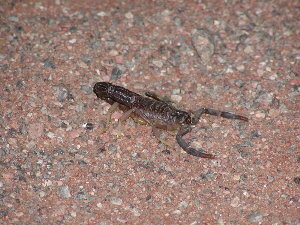 Oschadleus Poisonous black scorpion. Photo H.D. 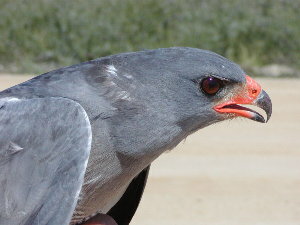 Oschadleus On the drive north to Windhoek, Dirk stopped to catch this Pale Chanting Goshawk with his bal-chatri. Photo H.D. 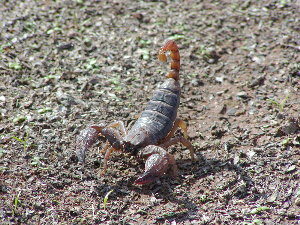 Oschadleus Along the road we also found this a less poisonous scorpion: note the small sting. Photo H.D. 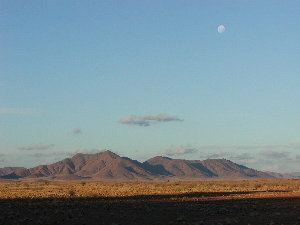 Oschadleus Farewell to Namibia. A special thanks to Peter and Marilyn Bridgeford, and Dirk Heinrich and Ursula Bader for the ringing sessions after the VSG meeting.